General Motors said drivers of its Volt electric cars are traveling 1,000 miles (1,600 kilometers) before they need to fill up, enough to make the vehicles more practical for daily use. 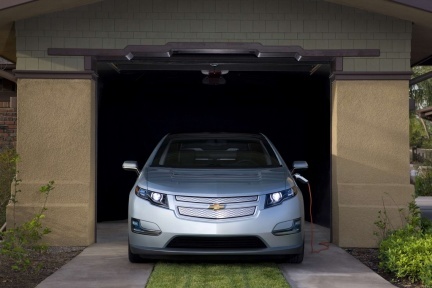 GM’s $41,000 plug-in Volt runs on batteries. When the charge dwindles, it switches to a gasoline-powered electric generator for longer ranges. The Detroit-based manufacturer sold 1,210 units in the U.S. in the first quarter, according to Autodata Corp. of Woodcliff Lake, New Jersey. “A sample of our early Volt customers suggest that they drive 1,000 miles before they fill up the gas tank,” Tony Posawatz, vehicle line director for the Chevrolet Volt, said at a conference in New York today. The estimates suggest automakers’ dreams of selling viable electric cars are getting closer to reality. President Barack Obama’s administration aims to have 1 million electric vehicles on the road by 2015. The U.S. Environmental Protection Agency has estimated the Volt’s electric-only driving range at 35 miles. Drivers may go another 344 miles on the gasoline generator, reaching a combined range of 379 miles, GM said in November. Consumers who don’t regularly drive very far can plug in the car to recharge and won’t use much fuel. Nissan Motor Co. has sold more than 10,000 of its Leaf electric vehicle globally, Andy Palmer, senior vice president at the Yokohama, Japan-based company, said today at a panel discussion with Posawatz. The $32,780 Leaf uses only batteries and doesn’t have a gas-powered generator. In fuel economy tests it traveled 73 miles on a fully charged battery, the EPA said in November. The company has estimated the driving range at 62 miles to 138 miles, depending on conditions, before it must be plugged in to recharge. The company has sold 452 Leafs in the U.S. this year, according to Autodata. Carlos Ghosn, chief executive officer of Yokohama, Japan- based Nissan, has said that 95 percent of drivers travel fewer than 100 miles a day, making the Leaf a practical fit for most people. Automakers plan to meet growing demand by introducing six plug-in electric vehicles this year, either battery-only models or those with back-up generators, and 14 more next year.